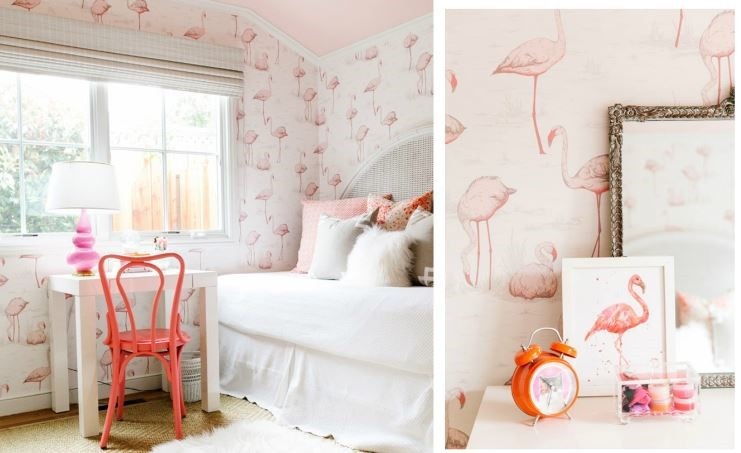 Funny how things pop out at you simultaneously, I was reading the new Rue and my friend Cristin from Simplified Bee is featured, her daughter’s room is delightful with its fab flamingo wallpaper, then I was browsing Kate Spade and the flamingo is all over her merchandise. That pink bird is popping up everywhere! The pink flamingo lawn ornament has enjoyed a history of kitsch, going from trendy to tacky then back again, now people with great taste position pink flamingos around their yards as a symbol of good times, pink flamingos are also trending in fashion and décor. I think they’re especially fun at a party in summer, don’t you? You can buy a pair for your yard, here’s a roundup of additional finds in his popular motif so you too can get your flamingo on. 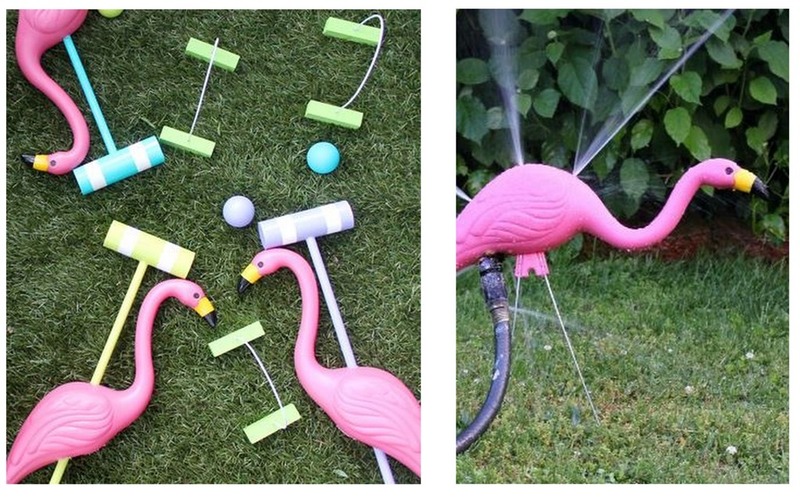 Also don’t miss these two fun DIY projects made with plastic lawn flamingos, the first is a croquet set from The Apron blog, the second is a flamingo sprinkler from Rain on a Tin Roof. Love the flamingo motif!! Two years ago, my daughter’s birthday party was a flamingo theme and it was so much fun to put together! All of my neighbors have flamingos in their yards because we actually live on a street called Flamingo Drive. I’ve resisted for SOOO long and while I may not stick them in the front yard, I’m definitely considering that adorable tank top! Those sheets! That mug! I had no idea that flamingos could look so good! Love them. I collect Flamingos….not tacky ones, old mid-century ones. Love all the new fabrics.n Would love the wallpaper in my Florida bathroom. I love me some pink flamingos! Thanks so much for including my flamingo sprinkler, Kate! Great images, you know what I’m seeing everywhere, tassels! Yes Tiffany, on ALL the pillows! And rugs and blankets ! And YES Miriam, my Mom and Dad have a pair in their yard, I love them! I loveee this trend! That room is fabulous and you can definitely grow with that and change accessories to fill the teen years to. Its so fun and pink (my fav!) great summer outdoor accessory to. We’re having a “Let’s Flamingle” housewarming party in two weeks! Got flamingo lights and plastic flamingos for decorations, flamingo napkins, a “Let’s Flamingle” sign from etsy, and will have a sign on the snacks table that says “We’re Tickled Pink You’re Here.” Love flamingos!! Do they look like these Susan? i actually spotted a pink flamingo in your mom”s backyard! am i wrong? flamingos are my all time fave birds: they are graceful…. Awe, I’m so touched! Thank you for the lovely mention. Those little flamingos are stealing a lot of hearts! Miss you! We will need to catch up soon.